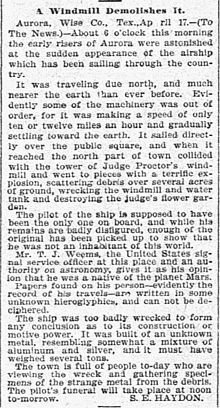 On April 17, 1897, a UFO hit a windmill and crashed, killing its pilot! Reports of UFO’s across the United States occurred during the 1890’s, before there were any airplanes. The April 19, 1897 Dallas Morning News reported that 2 days earlier the UFO cited above had crashed into a windmill, with the locals disposing of the wreckage in a well and giving the alien operator a Christian burial. Original newspaper article describing the incident, by S. E. Haydon, “A Windmill Demolishes It,” The Dallas Morning News, April 19, 1897, p. 5. A later owner of the property reportedly cleared the wreckage from the well and began using the well as a water source, but developed severe medical problems he attributed to the well and had it sealed over in 1957. Later investigations found no debris in the old well, and high traces of aluminum in the water. The remnants of the base of a windmill were also located at the well, lending some credibility to the initial accounts. It is unknown where the burial plot of the alien is located, although later investigation found an unknown grave at the local cemetery. Not receiving permission to dig the grave up, investigators used ground penetrating radar to attempt to determine the nature of the grave but were not able to determine any conclusive information. People that believe this incident is a hoax point to the lack of any further articles about the incident and the lack of any pieces of wreckage or traces of the alien’s body. Additionally, the town of Aurora had suffered a series of crippling economic disasters prior to the UFO incident leading some to believe the incident was manufactured as a way to draw people and attention to Aurora. A Texas Historical Commission marker outside the Aurora Cemetery, alleged burial site of the UFO pilot, which briefly mentions the incident. Television shows UFO Files and UFO Hunters ran episodes and investigations about the incident, as did a local television station. The state of Texas has a plaque at the site referring to the incident as a “legend.” The movie The Aurora Encounter (1986) is about the Aurora UFO incident, and the story has appeared on other television and comedy productions. Did the incident happen or not? Tell us what you think! Dudding, George. The Aurora 1897 UFO-Alien Encounter. 2013. Haydon, Stan. Aurora Texas 1897 UFO Crash: The Real Story? 2013. Next Article April 17, 1964: Ford Mustang Makes its Debut as A New Age of Automobiles is Dawned!